Start with good advice: from the local council’s heritage planner or a private heritage consultant. This will help you understand your place, find out about available grants, the approvals process, information required, and how to develop sympathetic renovations. Find a good fit: Fit the planned use to the site, building and room – whether the current use or a compatible new use. Examples: A bad fit is trying to fit four bedrooms and garage into a single-storey terrace on a small site. A good fit (or compatible use) is placing new kitchens or bathrooms into existing service rooms to limit damage to fine old interiors. Keep authenticity: Aim to retain inside and outside heritage features (like fireplaces, decorative ceilings, windows, roofs and fences) as part of new work. Reuse rather than remove or replace sound heritage materials. To maintain the value of your investment and avoid expensive future repairs use maintenance guides at www.heritage.nsw.gov.au/conservation. Position discretely: Place extra living space and changes to the rear or least-conspicuous position to maintain the main public appearance, setting and features of the place. Examples: Place additions and parking behind the building facade line. Converting the attic into an extra room may be an option where roof dormers can be fitted discretely at the rear. 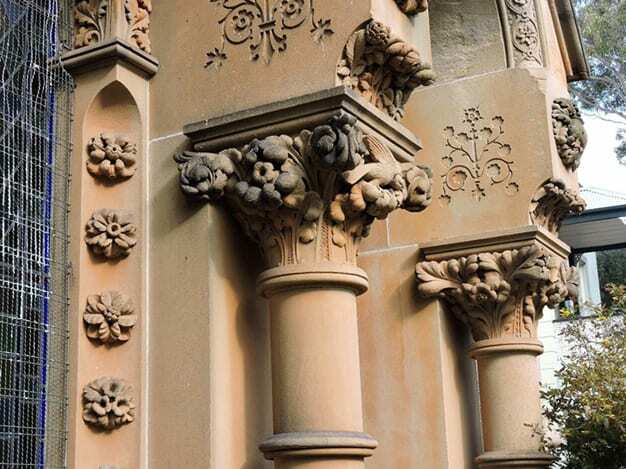 Continue patterns: In modern or traditional additions, reflect forms and patterns of adjoining old buildings or generally buildings within conservation areas without imitating its exact details to harmonise new with old. Examples: Window sill lines, materials, roof forms, building proportions and fences are typical patterns to follow with new additions. Separate new forms: Separate the mass of new buildings from the old so the old remains prominent. Examples: Using the main heritage building as the starting point, step-down the height of additions (wall and roof ridge heights), increase building set-backs, or use a pavilion style addition with a separate roof and low link to the old building. Reveal heritage features: Removing unsympathetic alterations and restoring original features like open verandas and fences can transform a place’s appearance and appeal. Make change reversible: meaning new work can be removed later without damaging the old. Example: Do not paint unpainted sandstone or face brick walls because paint cannot be removed without scarring. Impervious paints and sealants can also damage older masonry by spreading rising damp. (Ref 1) Heritage Listing – What it Means for You, Heritage Branch, NSW Department of Planning, 2010, updated 2011.